Party affiliation: None. I am comfortable existing outside of any political ideology. Where are you coming from? Houston, Texas, but I am originally from Lagos, Nigeria. How did you get to Tampa? 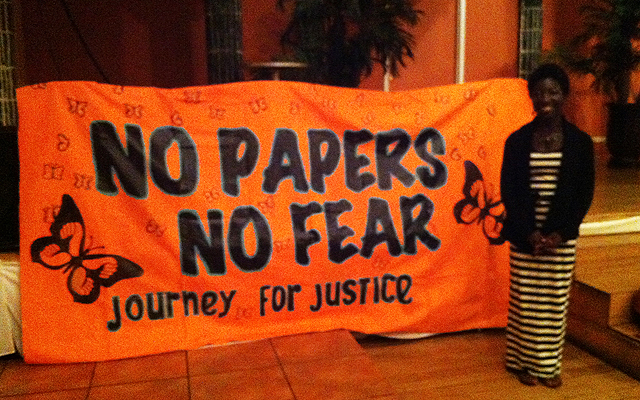 Undocubus came to Texas on their journey across the United States. I connected with them in Austin and decided to join them. I knew about them because I’m involved with the DREAMers. I took a flight from Texas to Atlanta, but when I got there, Undocubus was already in Tennessee. So I got on the MARTA at ATL and took it to the Greyhound Station, where I picked up a bus to Knoxville. Once I got to the Knoxville bus station, I hopped a cab to the nearby Unitarian Universalist Church where I found my travel companions. The only thing I didn’t do is ride a bike! CoLab Radio is profiling people who are standing outside of the Republican or Democratic National Convention with a message, a mission, or an item for sale. Post by Alexa Mills.